Lock in a great price for Melia Orlando Hotel – rated 8.2 by recent guests! Location, pool view. Great balcony areas. Big room. Everyone was so pleasant and friendly!! The staff at the front desk was very accommodating! The staff is amazing! Very polite and ready to let out staying better! The breakfast was very good. Nice pool. Very unhappy with the room on the first floor but I was able to change it to the fifth floor. Liked that they provided bikes- didn’t like having to walk to the gym especially early in the dark, dangerous crossing road and the valet isn’t available until 7am. Very nice and convenient and close to everything. Parks. Lots of dining and shops. Very confortable room and bed. Breakfast was good. Staff was VERY friendly. Everyone greeted you, held open doors etc. Friendliest hotel I have ever stayed. The facilities need an update, but staff were very pleasant, friendly and efficient. The water in our bathroom sink never got hot, so I left a note and it was fixed immediately. Breakfast was very good. Towels were thin, but replenished each day. Quiet place to get away from the bustle of the crowds. Tucked away by businesses. Decor and cleanliness was best. Melia Orlando Hotel This rating is a reflection of how the property compares to the industry standard when it comes to price, facilities and services available. It's based on a self-evaluation by the property. Use this rating to help choose your stay! One of our top picks in Orlando.Melia Orlando Hotel is located in the village of Celebration and is only 2.5 mi from Walt Disney World. The hotel offers free shuttle service to area theme parks and free WiFi. 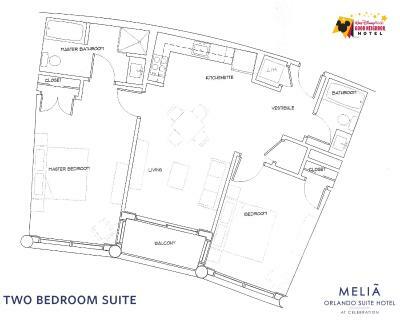 Suites at Melia Orlando Hotel feature a fully equipped kitchenette and a private balcony. All accommodations types offer a flat-screen TVs and iPod docking station. 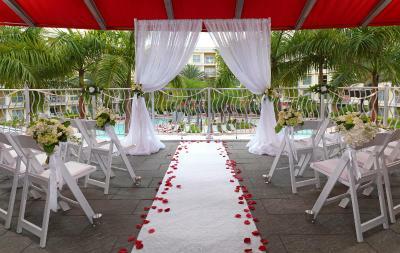 Guests can use the outdoor pool or the hot tub at the Melia Orlando Hotel. Orlando Vineland Premium Outlets is 18 minutes' drive from the property while Orlando International Airport is 21 mi away. 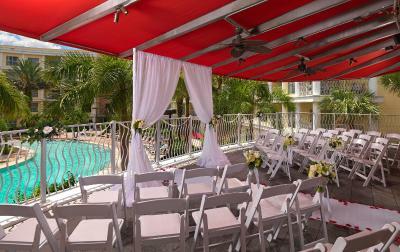 When would you like to stay at Melia Orlando Hotel? Offering over 750 square feet of space, this suite includes a sofa bed as well as a refrigerator, stove top, and microwave. A dish washer is also provided. Offering 1,064 square feet of space, this 2-bedroom suite features a pool view. A living room with a queen sofa bed is offered. This suite includes a kitchenette with a refrigerator, stove top, microwave, and a dishwasher. Three flat-screen TVs are included. A dining area with a dining table is available, as well. Offering 1,064 square feet of space, this 2-bedroom suite features a garden view. A living room with a queen sofa bed is offered. This suite includes a kitchenette with a refrigerator, stove top, microwave, and a dishwasher. Three flat-screen TVs are included. A dining area with a dining table is available, as well. This family suite offers a kitchenette with a refrigerator, stove top, microwave, and a dishwasher. Two full bathrooms are included. A queen sofa bed in the living room is offered. A dining area with a dining table is available, as well. A private balcony with sliding doors is offered for guests to enjoy. Offering 315 square feet of space, this guestroom includes a flat-screen TV and air conditioning. A full bathroom and closet are offered. A garden view is available for guests to enjoy. 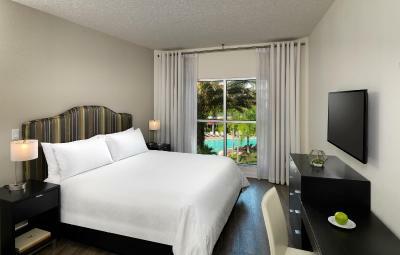 Offering 315 square feet of space, this guestroom overlooks the pool and includes a flat-screen TV and air conditioning. A full bathroom and closet are offered. Offering a pool view, this suite has 750 square feet of space. 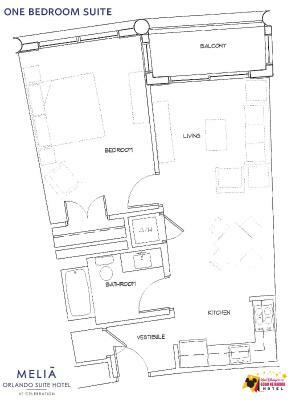 The suite offers a kitchenette complete with a refrigerator, stove top, microwave, and a dishwasher. A dining area with a dining table is also included. Two flat-screen TVs and a queen sofa bed are offered. Offering 1,064 square feet of space, this suite features a living room with a sofa bed. It includes a kitchenette, complete with a refrigerator, stove top, and a microwave. A dishwasher is also provided. Offering 1,064 square feet of space and overlooking the pool, this suite features a living room with a sofa bed. It includes a kitchenette, complete with a refrigerator, stove top, and a microwave. A dishwasher is also provided. 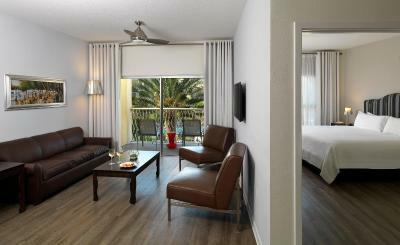 An oasis of stylish comfort just a short distance from Orlando’s countless attractions and parks. Enjoy family fun and relaxation at the sophisticated Meliá Orlando Suite Hotel at Celebration. House Rules Melia Orlando Hotel takes special requests – add in the next step! Melia Orlando Hotel accepts these cards and reserves the right to temporarily hold an amount prior to arrival. Please note the service charge is a facility fee and will be charged at the time of check-in. 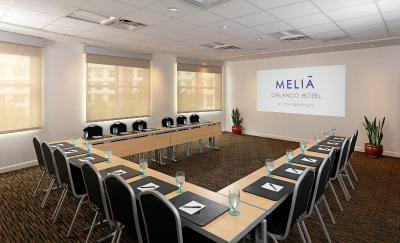 Please inform Melia Orlando Hotel of your expected arrival time in advance. You can use the Special Requests box when booking, or contact the property directly using the contact details in your confirmation. Walls are very thin, we had very loud neighbors all nights, but specially on the second one. An Indian family literally screaming till 3am. I knocked on their door and asked them to be quieter and the guy kept screaming, saying they were living for the airport soon and were trying to close a suitcase. The other nights I could also hear gaming and TV coming from the other bedroom. BTW i was on a room which had this shared door with another (that was locked) and this was the problematic room. I don’t know if other rooms have the same problem, but I never came across that type of problem in a hotel before, so I’d consider insulating more the walls. If you can’t sleep well on your holidays, that makes for a crappy holiday. Liked that you had croissants and quinoa on breakfast and that it changes everyday. The fruit and bread selection was poor, wish you had more variety like papaya, mangos, oranges, and a seeded bread. Justin took us to downtown a few times, he was very friendly and this shuttle service is really convenient to avoid driving everywhere. Some features of the room can be upgraded to modern style as most of the other in room features. Room door should be upgraded. They did not have bicycles as they advertised. The facility fee was a surprise. The happy hour was a disappointment. The nachos were cold....chicken, cheese everything...yuck! The internet signal was not working well.. Lack of amenities This is a decent hotel for the money but should not be classified as a resort. Uncomfortable couch, poor breakfast experience (ran out of food and slow to replenish). Housekeeping staff member did not speak English, which would have been helpful when we requested assistance. The "garden view" wasn't really a garden .